It was my turn for the charity baking at work this week. I wanted to continue putting my new loaf tin to good use, so I settled on this sticky marmalade tealoaf – a suitably warming treat for this cold weather. The recipe is brilliant – lots of marmalade, lashings of ground ginger and some mixed spice, combined with light muscovado sugar and pecans. Yum yum yum! Plus, it’s incredibly easy to make – you just throw everything in a bowl, mix and bake, before slathering some more marmalade on top for the stickiness. 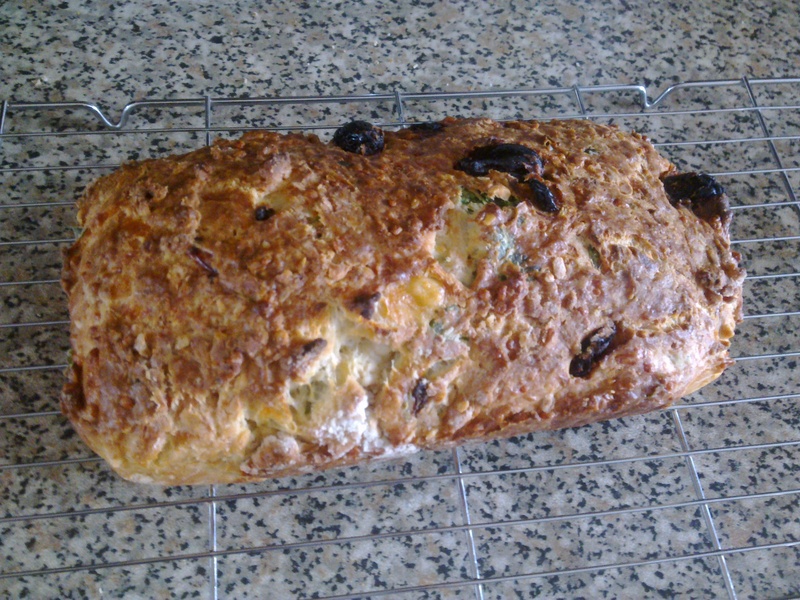 It baked in the time specified by the recipe, although the final texture was a bit more crumbly than the previous times I’ve baked this tealoaf. 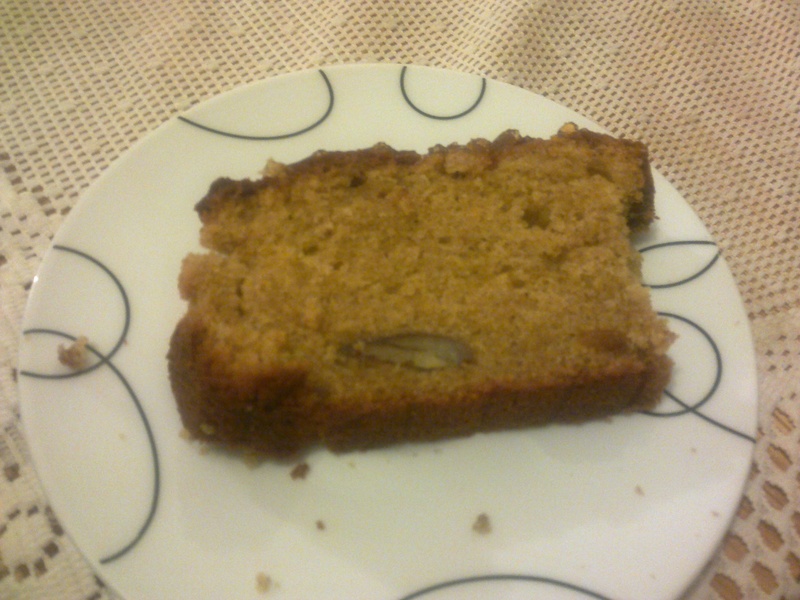 It was a slight struggle getting it to cut into neat slices – the pic below was the best of the lot! I *think* it went down well in the office, although it can be hard to tell sometimes! The bit I tasted was perfect; moist, spicy, sweet, slightly bitter and – most importantly – sticky. It’s lovely while it’s still warm – just the thing to have when you’ve come in from the cold and want a cup of tea with something sugary. From BBC Good Food 101 Cakes & Bakes. What I think is the same recipe is available online here too – I would definitely recommend using pecan halves instead of mixed nuts, though. Savoury bakes seem to be controversial for certain people, for some reason. I can’t understand why – if you want a sweet cake, go and have one, but don’t carp on at those of us who like to have something different every now and then! My favorite savoury baking recipe to date is Dan Lepard’s courgette and mozzarella muffins, but this goat’s cheese, hazelnut and raisin cake recipe by Hugh Fearnley-Whittingstall could give those trusty muffins a run for their money. I recently acquired a proper loaf tin and quite fancied baking something new in it – and being an avid fan of all things cheese-related, I quickly settled on this recipe. The recipe has quite a long list of ingredients, but the cake is surprisingly easy to make in spite of this. 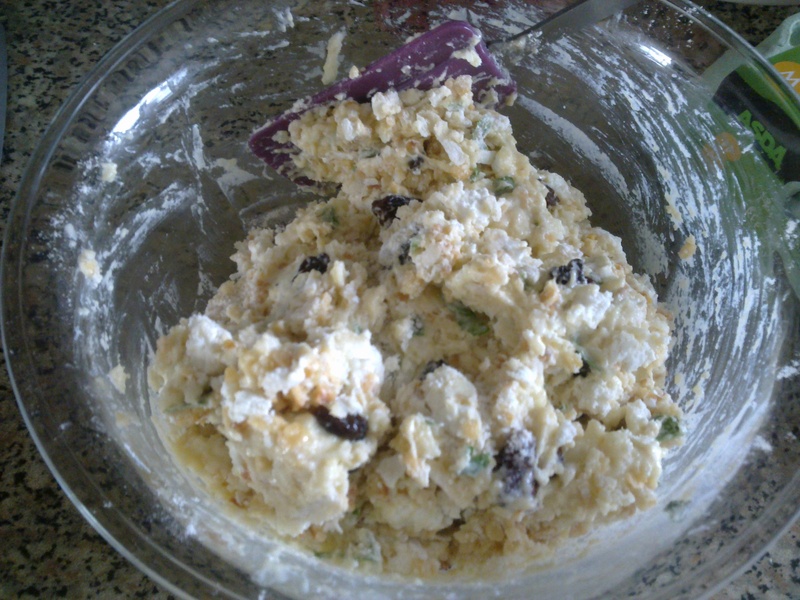 It uses the method of adding wet ingredients to dry, and the important thing is to not over mix it, much like with muffins. 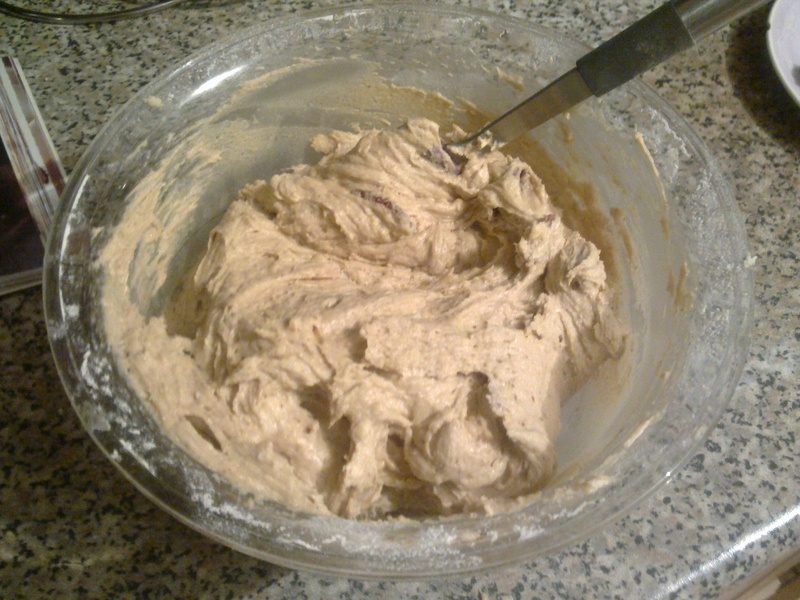 The resulting mixture is very thick, and I had to push it into the corners of the tin. 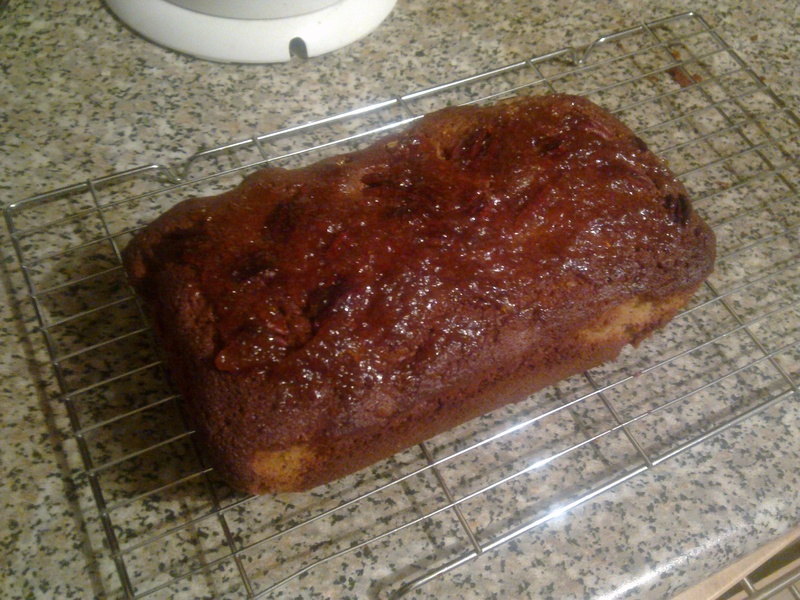 It baked in 45 minutes as specified in the recipe, which is always nice! (I tend to get fairly distressed when my baking time differs from the recipe). The first thing that hit me when I opened the oven was the delicious smell of two kinds of goat’s cheese (hard and soft) cooking away. Goat’s cheese is generally very mild, but it seems to become much stronger in flavour after cooking. The texure of the cake is more akin to that of a tealoaf than an actual cake, in my opinion, which is probably down to the lack of butter. Taste-wise, it’s a bit of a sensation – you can certainly taste the cheese, but the hazelnut chips in before that becomes too overwhelming, and both are nicely complemented by the delicate sweetness of the raisins (which are the big olive-like things you can see in the first picture – they swelled up massively in the oven!). This was a definite hit and something I would make again. My boyfriend suggested that it would be a nice alternative to bread with soup, and I also think that would work well. 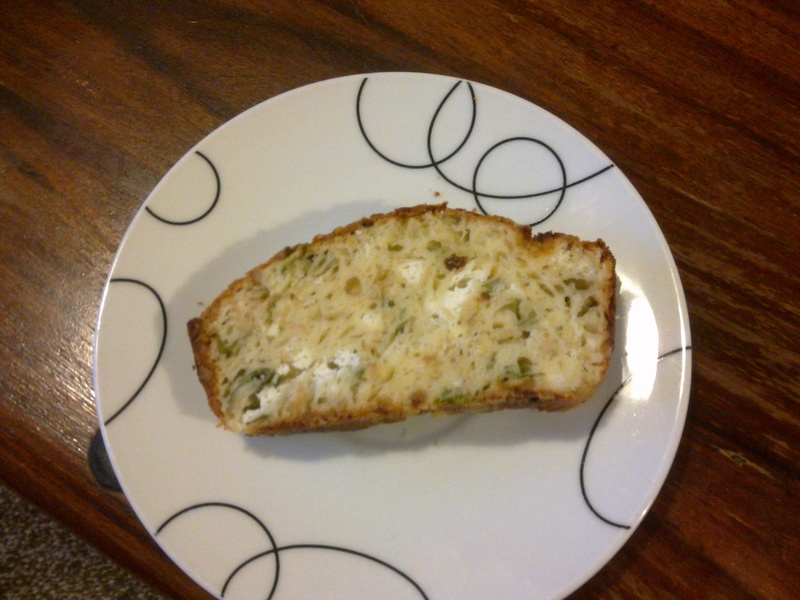 I can’t wait to try more savoury cakes – HFW’s recipe for carrot and feta cake will probably be next on my hitlist! From Hugh Fearnley-Whittingstall’s Guardian column here. 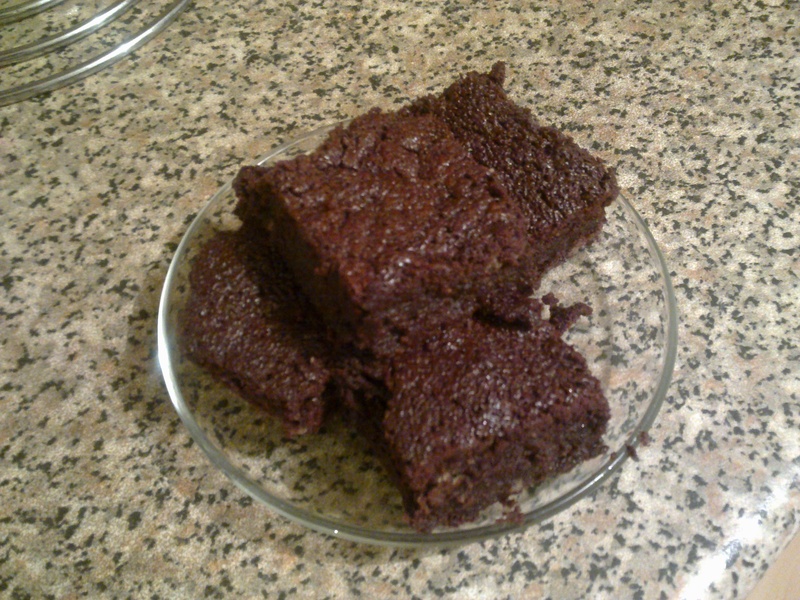 As promised, here’s my ultra-chocolatey bake in honour of Chocolate Week. It’s one of my all-time favourites and a recipe that I’ve baked many times, because it really does create the perfect chocolate brownie! 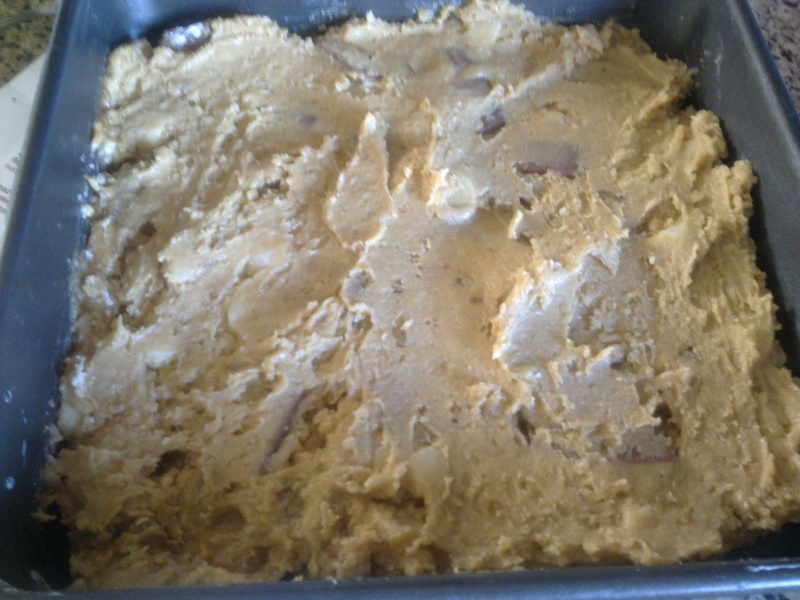 Dark muscovado sugar creates the toffee flavour here. The original recipe calls for 350g of dark chocolate with between 50 and 60 per cent cocoa solids, presumably so the chocolate doesn’t overpower the toffee taste. However, the first time I baked the brownies I completely missed this requirement and used chocolate with much more cocoa solids – I’ve used everything from 50 to 90 (!) per cent over the years (I used 70 per cent this time round). I prefer the higher cocoa content by far – you can still taste the toffee flavour, but you also get an amazingly dense chocolate hit that is guaranteed to make you feel a bit weird (in a good way!). The method itself is very simple – melt the chocolate and butter together (and resist sticking your finger in the resulting thick, glossy liquid…), whisk the eggs and sugar together, fold the chocolate and butter into the eggs and sugar, add flour and baking powder, and stir. 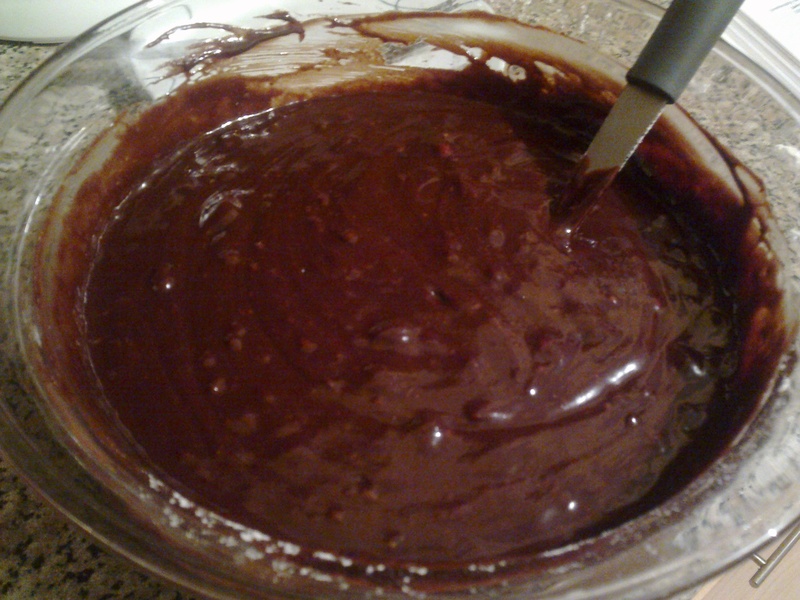 The only issue I’ve had is the fact it always takes me a lot longer to bake the brownies in the oven than the recipe says – it calls for a time of 30-35 mins until firm, but it’s still pretty liquid at this point for me, so I usually have to leave them in for 15-20 mins more. Not sure if this is down to my mix or my oven (a gas one)! The resulting brownie is fantastic – slightly cakey but pleasingly squidgy, and not too heavy (although the sheer amount of chocolate is enough to put certain sensible people off from having more in case it makes their brains explode! No joke…). I would recommend trying this out if you’ve been searching high and low for *that* perfect brownie recipe – it really is brilliant and one I’ll continue to use for years to come. From BBC Good Food 101 Cakes & Bakes. A kind soul has also added it to the BBC Good Food website as a member recipe here. Both of these are perfect for chocoholics, although the muffins are definitely the ultimate cocoa-filled treat! 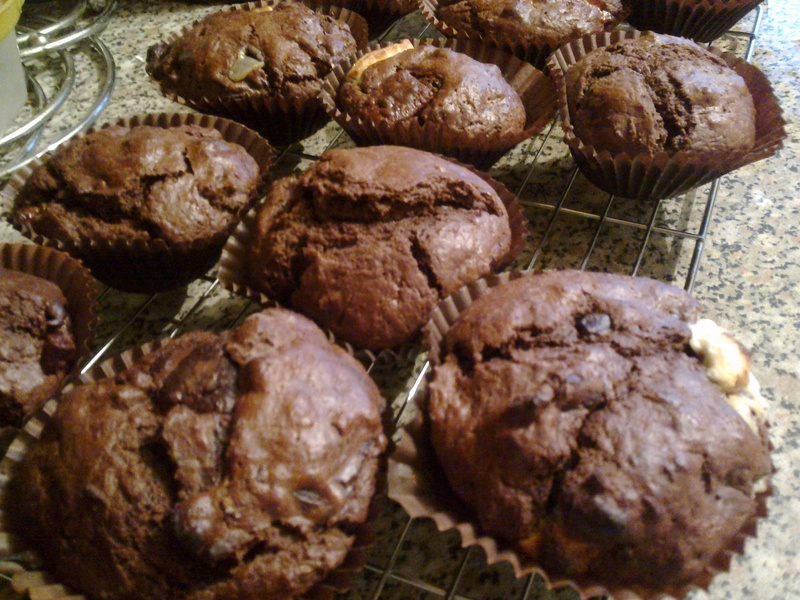 Another triple chocolate delight, but a little more sophisticated than the muffins and perfect for a dinner party. This Dan Lepard recipe really is alchemy – how is it possible for tinned pears and a bit of cocoa powder to become this gorgeously moist, chocolatey cake?! And not a knob of butter in sight. This is a super sweet treat for both chocolate and coffee fans. Just keep an eye on the icing to make sure it doesn’t go as runny as mine did! I absolutely love using white chocolate in baking, and this is a prime example of how well it can work. It’s time to wrap up the competition I announced last week to win a BBC Good Food 101 Cakes & Bakes book by telling me about your favourite bake on this blog. There were some rather excellent entries, but my favourite comment – and therefore the winner – was this one from Anastasia on my cinnamon Nutella cake, which she actually had a go at baking! It looked delicious on your pictures so we thought – hey ho we got to try it. It was fun, it tasted great, unfortunately when we took it to the recent Macmillans coffee and cake day at our local childrens centre, mums thought that sunken nutella was just a bit of burned cake – that is until they actually tried it. So for a laugh we said it was cinnamon surprise cake . And no there was not a single mother that day that would know how to stop nutella from sinking I’m afraid. Congratulations Anastasia! Send your address to theveryhungrybaker-at-yahoo-dot-co-dot-uk and I’ll get the book sent out asap! 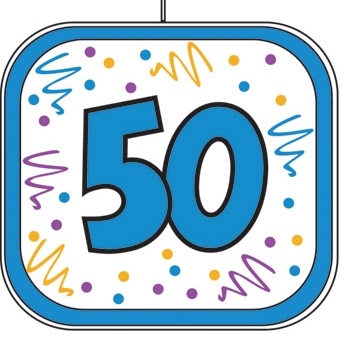 Thanks to everyone for entering – here’s to 50 more bakes! Macadamia nuts are one of my boyfriend’s favourite things, so I thought I’d bake something containing them, seeing as I’ve never used them before. They’re very nice indeed – smooth in texture and not too ‘nutty’ in flavour, making them perfect for a sugary bake like these butterscotch bars. There’s no actual butterscotch in these, although they do taste quite caramel-like. They’re also extremely quick and easy to make, which is just as well considering I whipped them up in a bit of a panic on Saturday morning after forgetting to do it on Friday evening! 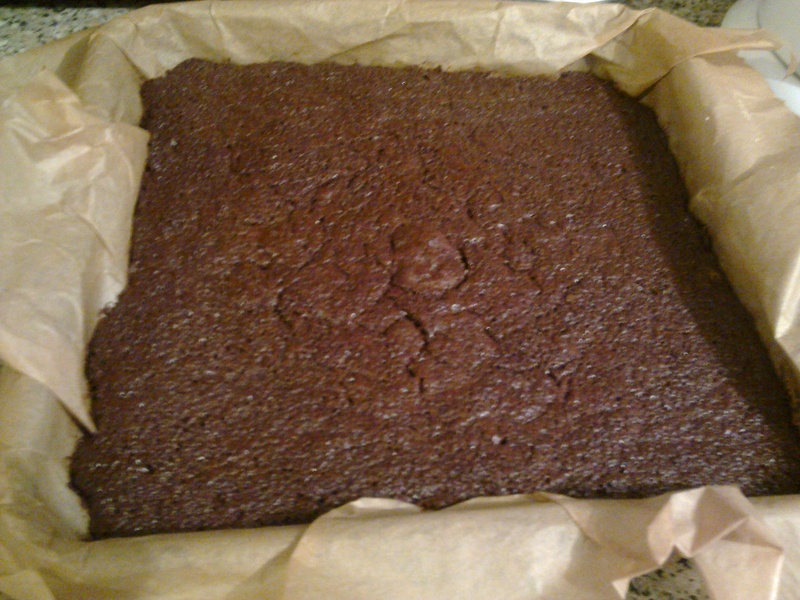 I deviated from the recipe in a few ways – I used light brown sugar instead of light muscovado, as I didn’t have any in, and used a 20 cm x 20 cm square tin instead of a rectangular one (and baked for 5-10 mins longer to take into account the thicker layer of mixture), hence why these look more like squares than bars! The recipe also recommends using Green & Black’s milk chocolate, but I instead used my last bar of Milka Alpine Milk chocolate. There’s a LOT of sugar in this recipe. I half toyed with the idea of putting less in, but decided to stick with it in the end, just in case. I’m glad I did, because the bars actually weren’t anywhere near as sweet as I thought they would be! They also weren’t overly chocolatey (not that there’s such a thing in my world), so all the flavours balanced nicely. 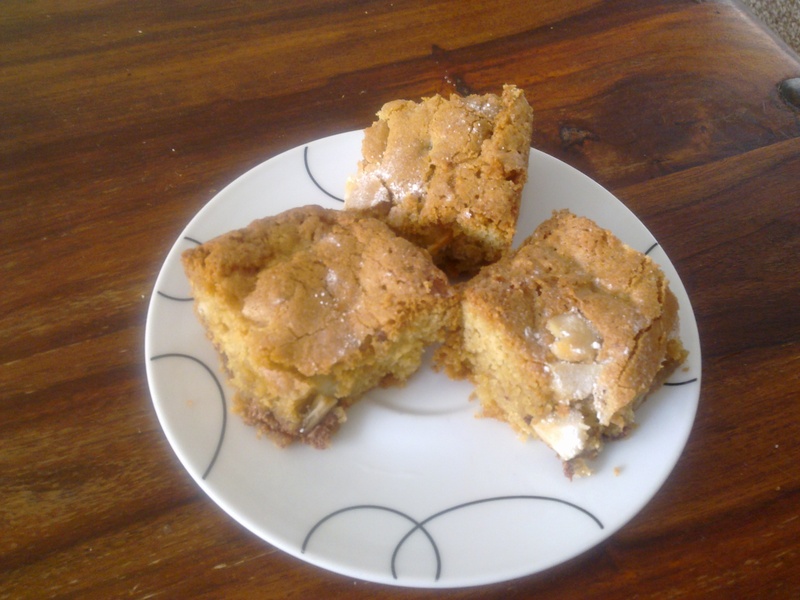 The butterscotch bars were a hit with everyone who tried them, so I think I would make these again. It’s a recommended recipe for anyone searching for a quick and easy bake that will please everyone! P.S. Don’t forget to enter my competition to win a free copy of the BBC Good Food 101 Cakes & Bakes book for more quick and easy recipes! Yep, this is the 50th post on this blog since starting it up back in February! To celebrate, I’m giving away a copy of one of my favourite baking books – BBC Good Food’s 101 Cakes & Bakes. If you’re a regular reader, you’ll know just how much I love this book and its easy yet delicious recipes! I’ll make a decision next Tuesday evening (October 9th) and will announce the winner in a post then.